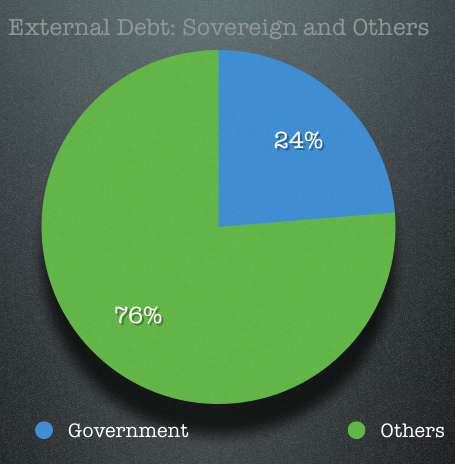 I wrote about India’s external debt over a year ago, and the Ministry of Finance has released a new report on India’s external debt that gives a good opportunity to revisit the topic, and look at some numbers again. For a short period earlier this year, falling Rupee, declining forex reserves and rising external debt made some articles talk about an Indian sovereign debt default but that didn’t last long and it’s largely because government’s debt is only a small portion of the overall external debt. Out of the total debt of $345.8 billion, government’s share was $81.9 billion and the remaining $ 263.9 was others. This total external debt has increased from $305.9 billion from March 2011 and growth has been driven by a rise in external commercial borrowings and NRI deposits. RBI took several measures to arrest the Rupee slide, and freeing NRO and NRE interest rates were some of those steps, so in a way that debt increased due to NRI deposits is a good thing. The interesting thing about NRI deposits and their contribution to external debt is that they make Rupee the second most dominant currency in India’s external debt. I was really surprised to discover this last year, and seeing INR in the list of currencies in which India owes money to foreigners was the last thing I expected. 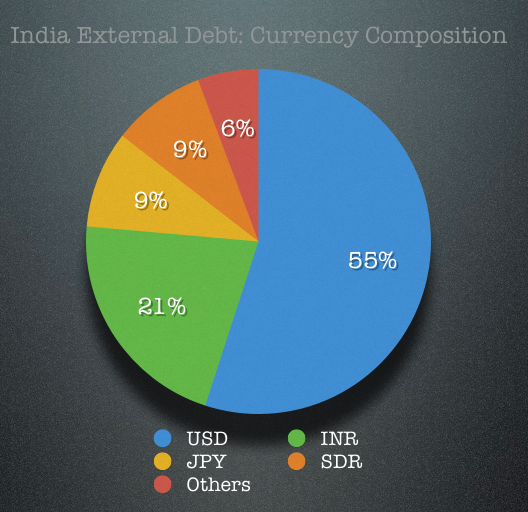 Here is the currency composition of India’s external debt as at March 2012. I think the Rupee being a big part of the external debt is a pretty significant thing and if you look at how NRIs open their NRE / NRO fixed deposits — a lot of them don’t have the intention to convert this back to a foreign currency, and need to use this money in India itself. Not all of the INR debt is NRI deposits though, from last year’s numbers I know that about 30% of this is FII money that’s invested in government treasuries and corporate debt, and that has a higher probability of going out of the country one day. From whatever little I understand, it seems to me that worrying about external default should feature pretty low in the long list of things that India has to worry about and tackle more quickly like a big fiscal deficit, stalled reforms, corruption, lack on infrastructure investments, land reforms, labor reforms and even the depreciating Rupee. Kudos Manshu, surely an informative piece. Couple of things I want to say here. Its a very big topic for discussion and almost like stirring a hornet’s nest if I can say so. Flight of safety is something we need to consider when we talk of NRE/NRO deposits. Low interest rate regime in already developed countries coupled with less risk default and higher interest rates is definitely going to attract more and more such inflows. The 24% debt you have shown as Govt debt, does it include both private and public debt altogether?